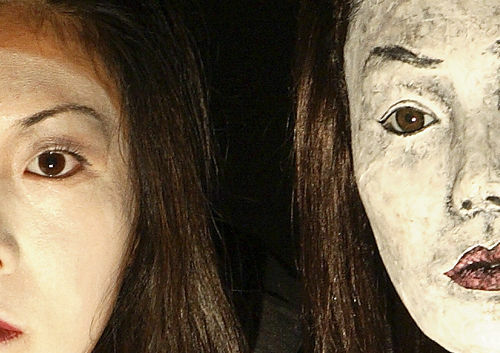 Pupp-acting is an innovative form of performance which fuses acting and puppetry. Performers are able to simultaneously animate a Bunraku-style puppet and interact with it as a different character. Our workshops range from the learning of the core principles of pupp-acting to the construction of puppets and the creation of short individual pieces. Participants train with the company’s specially designed puppets and learn the three core principles of pupp-acting: body, gaze and speech. Suitable for people with some experience in performance. Duration: from 3 hours to one day. Participants create a short performance using pupp-acting, from conception to performance. The intensive workshop is divided into three phases. The first phase consists of the participant designing and constructing their own Bunraku-style puppet. 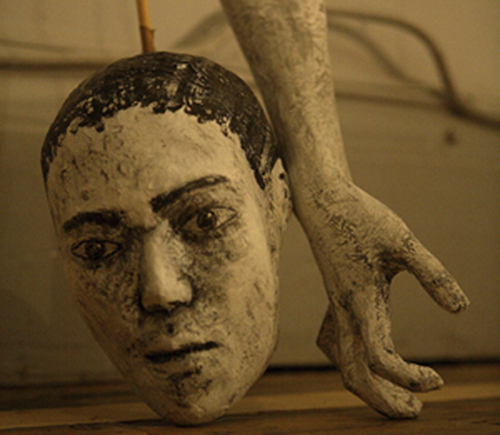 The puppets are made in papier-mâché by casting body parts of the participants. In the second stage they train in pupp-acting with their puppet. During the final stage they devise and perform a short piece. 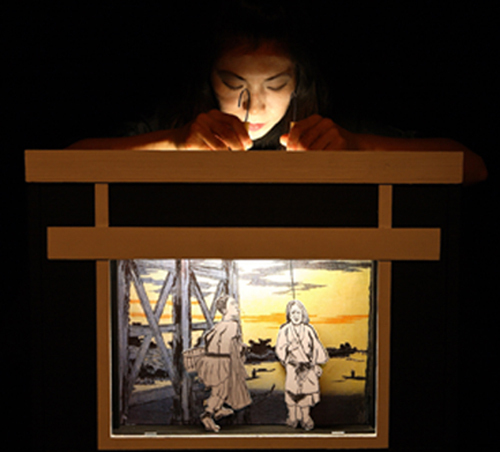 The tradition of paper theatre can be found in both European and Japanese cultures. In Japan, this form of live 2D animation is known as kamishibai, and is the ancestor of Manga. The aim of this workshop is to gain the necessary skills to build your own paper theatre including box, set and puppets in order to create your own short performance. Participants are asked to bring a piece of writing from any genre (short story, novel, poem, myth) as the starting point of each individual piece. Participants learn to construct a Bunraku-style puppet in papier-mâché by using cast of their own body parts. This technique of puppet making is inspired by the work of acclaimed German puppeteer Ilka Schönbein. Suitable for puppet makers, prop makers and theatre designers. This workshop is an introduction to puppetry. It covers a range of techniques from the animation of everyday objects to a simple table-top puppet. This workshop combines storytelling based on Shakespeare’s plays with the animation of cutlery, cups, glasses and food to create short pieces performed on kitchen tables. If you are interested by our workshops or lectures but you need something more specific to your needs do not hesitate to contact us. We can always adapt them to your requirements. Rouge28 Theatre creates performances that combine different techniques and styles such as acting, puppetry, storytelling and object manipulation in an original and unique way. The company offers a variety of workshops to people interested in getting training in the techniques that we have elaborated over the years. Workshops can last from a few hours to a full week and range from an introduction to puppet animation to the making and performing of your own short piece. We also offer academic lectures on contemporary puppet theatre.